July 4th Fireworks on Maui (7.4.17) PC: Rachael Johnson. 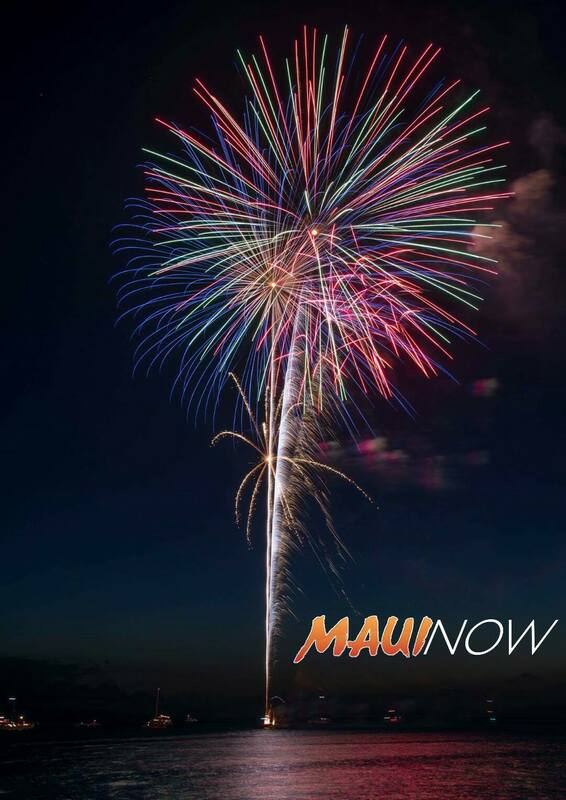 There will be two public aerial firework displays in Maui County for the Fourth of July holiday this year. The first will occur on the Fourth of July at around 8 p.m. from an offshore barge along Front Street in Lahaina. A separate display is planned for Saturday, July 7, 2018, at around 9 p.m., as part of the 26th annual Lānaʻi Pineapple Festival in Dole Park on the island of Lānaʻi. The County of Maui’s, Department of Fire and Public Safety announced the sale of July 4th fireworks beginning on Friday, June 29, 2018 and ending on Wednesday, July 4, 2018 at 8 p.m.
A fireworks permit is not required for consumer fireworks such as sparklers, snakes, and cylindrical or cone fountains which emit effects not higher than 12 feet off the ground; However, a fireworks permit is required for the use of fire crackers. Each permit costs $25 payable by check/money order to the County of Maui. Cash will be accepted at the Fire Prevention Bureau. 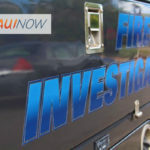 CENTRAL MAUI, Fire Prevention Bureau – 313 Manea Pl. Waikapu Consolidated Baseyard (County Offices are closed on Wednesday, July 4, 2018 in observance of the 4th of July Holiday). 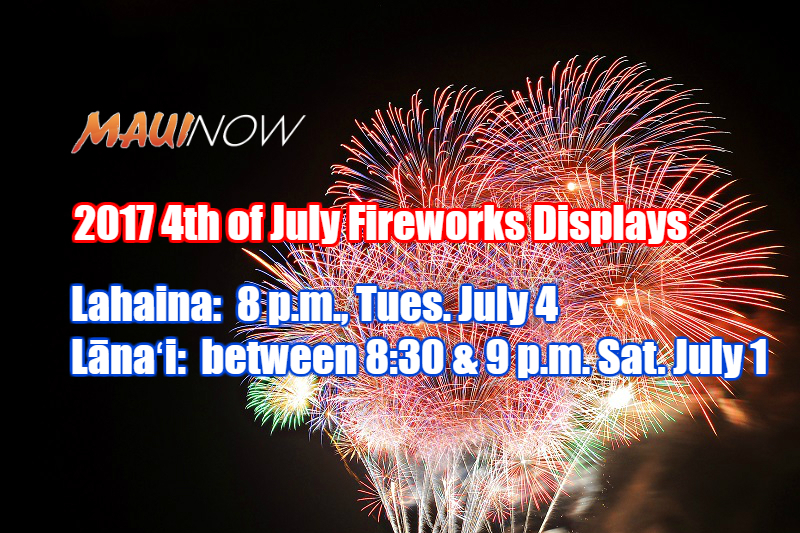 A limited number of fireworks permits will be available in KAHULUI at Phantom Fireworks, front parking lot of Queen Kaahumanu Center, 275 West Kaahumanu Ave. Setting off fireworks outside designated times is punishable by law. Violations are subject to fines of up to $2,000. 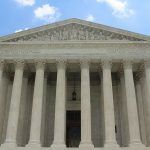 It is unlawful for any person to offer for sale, sell or give any fireworks to minors, and for any minors to possess, purchase, or set off, ignite or otherwise cause to explode any fireworks, except that the parents or guardians may allow the minor to use fireworks while under the immediate supervision and control of an adult. 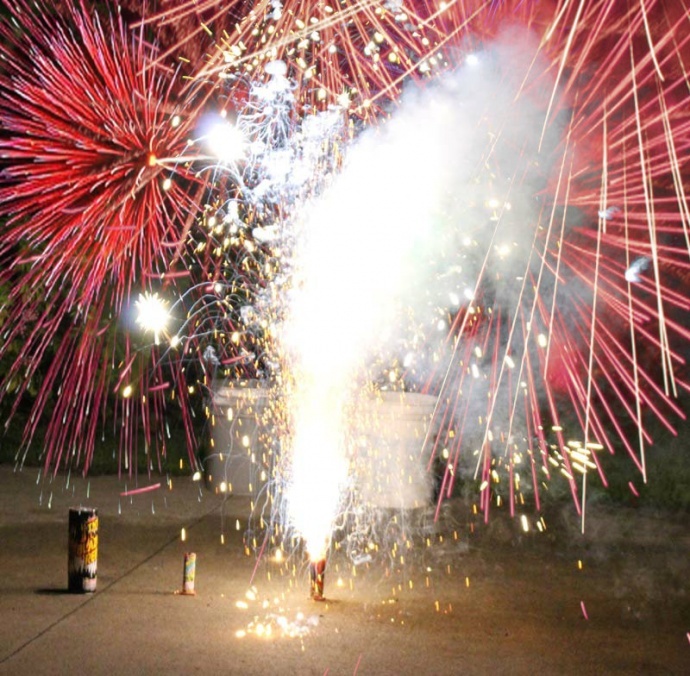 Fireworks can be dangerous, causing serious burns and eye injuries. Young children and fireworks do not mix. 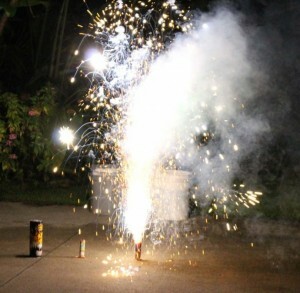 Never give fireworks, even sparklers to young children. Sparklers burn at temperatures of 2,000 degrees Fahrenheit. Older children should only use fireworks under the direct supervision of an adult. Always read and follow all warnings and instructions listed by the manufacturer for the safe use and handling of fireworks. Make sure you have a clear, flat area to use the fireworks; away from structures, dry grass or brush, or other readily ignitable materials. Have a water hose or bucket of water readily available in case of a fire. Lahaina 4th of July Fireworks: Offshore barge along Front Street, Lahaina Maui. July 4, 2018 – begins approx. 8 p.m.
26th Annual Lānaʻi Pineapple Festival, Dole Park, Awalua Ave., Lānaʻi. July 7, 2018 – begins approx. 9 p.m.
“Unfortunately, this activity increases our community’s risk of fire and fire-related injuries,” fire officials said. To ensure the community can continue celebrating the start of the new year with fireworks and avoid the risks associated with its use, the department recommends the following: supervise children using fireworks, follow the manufacturer’s instructions and safety tips provided, use common sense, and watch out for each other’s safety. For additional information on fireworks permits, contact the Maui Fire Department’s, Fire Prevention Bureau at (808) 876-4690 or refer to the Hawaiʻi Revised Statutes 132D.